today my daughter Isabella’s kindergarten class is having a “pajama and teddy bear” day to celebrate the invention of the teddy bear (it’s a fun read if you don’t know the history). yup. that’s how they roll in kindergarten… jealous much? surprisingly, we don’t have all that many teddy bears around the house, and none that she was particularly attached to. so natch, my first thought was hey, bet i can find a pattern to make one… and i quickly came upon a pattern and tutorial by HowJoyful and fell head over heels for it’s adorableness. i printed the pattern and scoured my minkey dot and flannel scraps and started cutting. i thought the pieces seemed a little big, but somehow in the tutorial it looks like a small-ish toy so i didn’t think much of it. 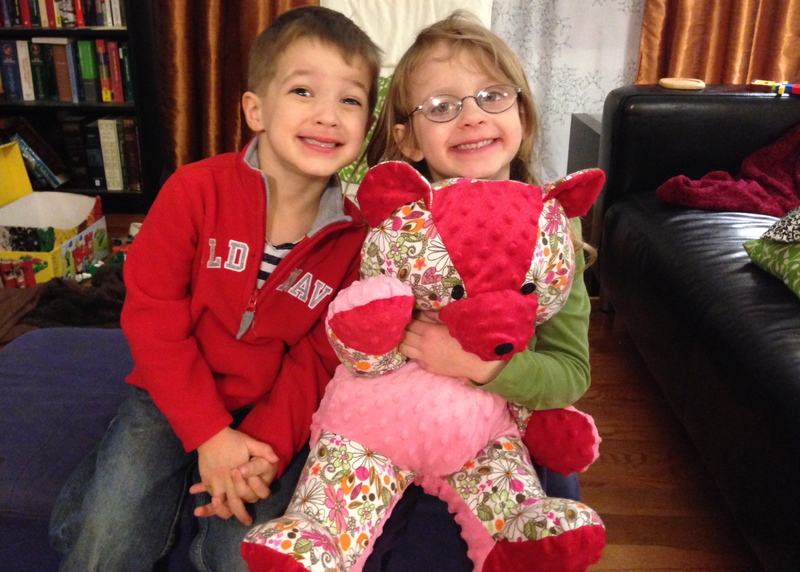 skip to the end of the story and you’ll find out that this is a 16″ bear. keep those pattern pieces handy, and make sure the cut fabric is labeled (i kept the pattern piece pinned to the fabric pieces until i needed them). all the corners are labeled with letters to match up seams and you will definitely need to go back and refer to pieces as you go along. 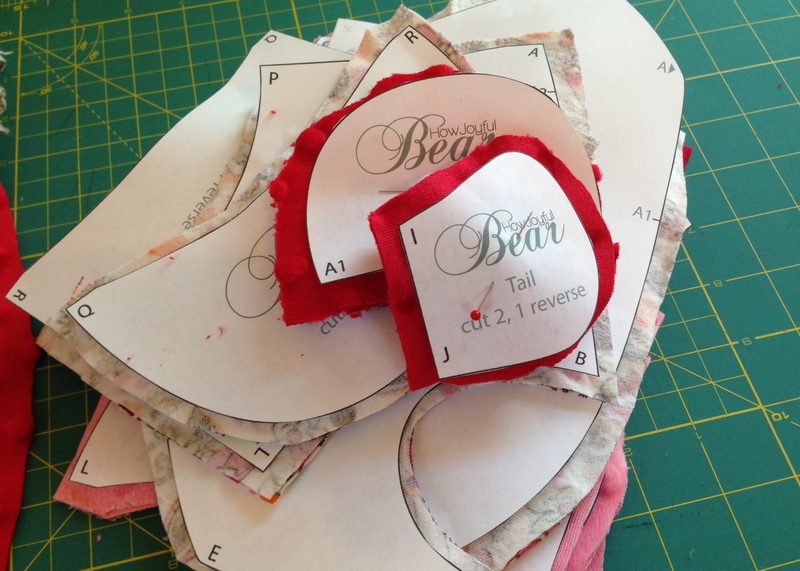 there are places where you should stop sewing at the SA line, not the end of the pattern piece, so keep an eye on a picture of the finished bear to see if there is a join you should know about. the SA are not included on the pattern, so it’s probably best to trace the pieces onto the fabric, then eyeball the 1/4″ SA as you cut them out. if you want a smaller bear, scale down the pattern a little. 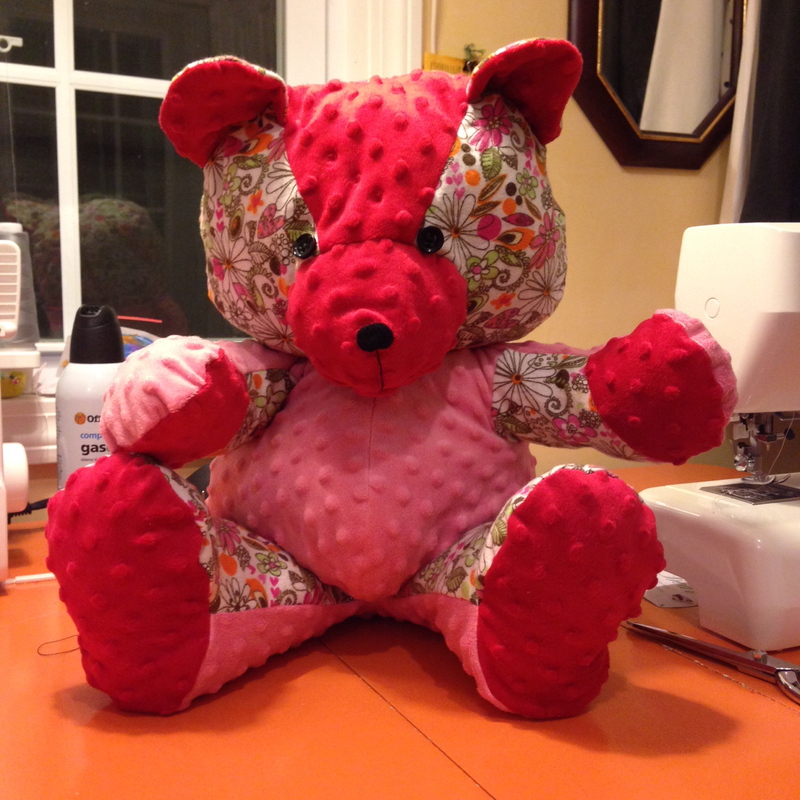 however, a larger bear is much easier to sew for a beginner than a small one, unless you’re keen on hand sewing. not mentioned in the pattern: stuff the nose and close off the back so you can form the mouth and nose. i ended up cutting a 4″ diameter circle and whip stitching it around the nose/mouth area. this is probably something toy-makers know, but i nearly didn’t catch it. the directions have you sew up the head/body join last, stuff, and hand stitch it closed. next time i’ll leave a different opening for stuffing (either part of the back or the seat). the neck is not only a difficult place to hand sew closed, but it also takes considerable abuse when yanked around by a kid. there was definitely some head scratching along the way. the tutorial and accompanying photos don’t necessarily follow each other in order, so you have to jump around a bit. despite that i somehow managed to create this super cute teddy bear! subsequent makes will definitely go smoother (and judging by the jealousy coming from her three siblings there will be more teddy bears), and all in all it’s a pretty quick thing to make. there are a lot of pieces, but you can really pluck along at a good pace. and hey, that one holiday that shall not be named is just around the corner, so go make a teddy bear. it’s FUN! one thing i’ve been trying to do over the past year is make things to fill gaps in my wardrobe. blouses rank very high on that list, so i pulled out mccalls 6793. maybe it’s the archers in my life speaking, but i’ve been fully embracing the boxy tops as of late. the fabric i have is a cotton lawn of the most silky variety. i found this yardage at my local fabric haunt for $3.99/yd (score!) and i can not believe that it’s just cotton. those super high quality cottons i’ve read of were really only the stuff of legends to me, and now i get it. the feel is amazing! to be honest, i don’t 100% love the print. it’s okay, but with that feel at that price it had to come home with me. initially i planed to make a scout tee, but the print is so large i thought it needed some extra details to break up the print, hence the bow. this pattern is sized XS-S-M-L-XL-XXL which always annoys me. i get that with the boxy fit individual sizes aren’t totally necessary, but still. knowing that you usually need to size down with these patterns it’s hard to pick a size to go with. i went with a S at the bust, grading out to the M at the waist/hip. to make sure it didn’t cling over my hips i made a curved hemline and lengthened the back by 1″. my measurements hit the upper end of the sizes i chose, so i thought i’d be pretty safe. and really it’s not far off, i like the fit in the bust/shoulders, but i really could have kept to the small at least through the waist and just flared out at the hip. partially to blame is my fabric choice which has a touch too much body for this fit (this pattern would be great in a rayon or silk crepe de chine). i’ll probably end up taking the sides in a little, but other than that i’m happy with it. not trying to look all stiff here… it was windy and i was trying to keep my top in place. also, bad lighting… sorry! the bow part is a real fabric hog, by the way. it’s cut on the bias, which gives it a nice soft drape, but since the two pieces have to be cut perpendicular to each other to keep the direction of the print the same for each side it’s really fabric inefficient. ya’ll know how much i like to conserve fabric, so it definitely hurt a little. when attaching the ties around the neckline, you are supposed to slipstitch the entire inner seam, but i opted to stitch in the ditch from the outside and catch the turned in SA on the inside. i don’t mind hand sewing, but if i can avoid it i will. initially i had cut the blouse-y 3/4 length sleeves, but the print would have been way too overwhelming. i pulled out the cap sleeve pattern piece and went with that instead. i thought that the cap sleeve would be easy to sew, but man it was finicky. 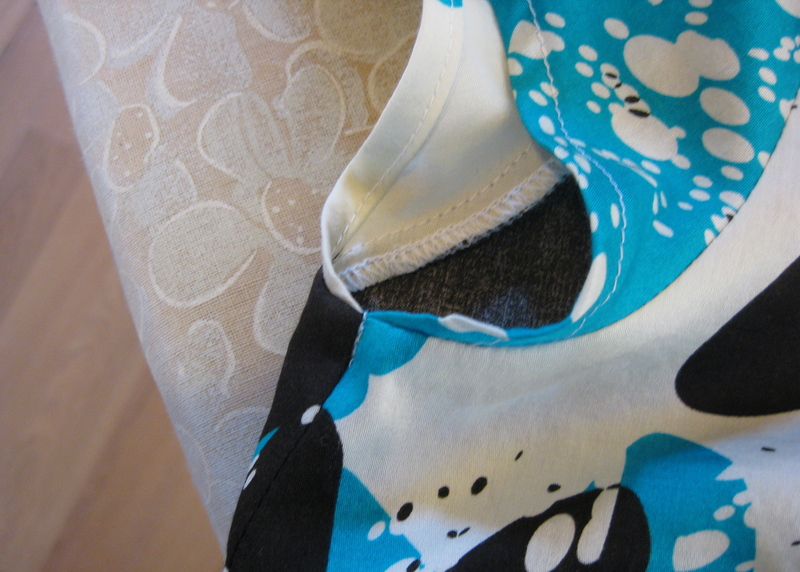 instead of sewing the sleeve together under the arm, you overlap the ends at the side seam. much harder than it sounds! i should have reduced the SA from the get go, i forgot how hard it is to sew these tricky bits with 5/8″ in the way. then, to keep the SA from flipping out, i stitched in the ditch to tack the SA down under the arm. i didn’t muslin this top, but i did make some flat pattern adjustments before cutting. i made a 1/4″ FSA (forward shoulder) and pinched out 3/8″ all around above the bust line. i find that despite my height, my upper body is petite, so typically i have indecently low necklines and gaping armholes. those adjustments worked out perfectly, yay me! 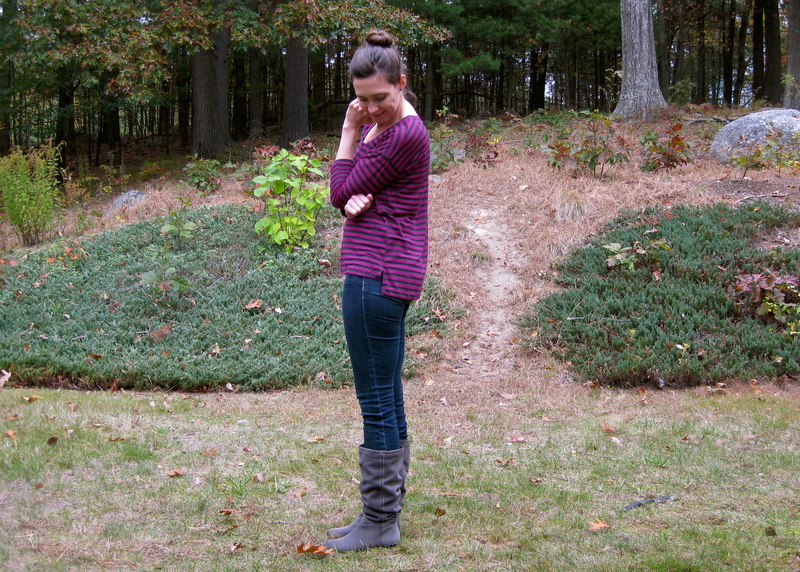 i knew i wanted to try out grainline’s hemlock tee the minute i saw it. it looked super comfy and lounge-y and quick to make up. i picked up some lightweight striped knit and knew it would be a perfect match. i made a couple changes to the pattern, first i scooped out the neckline by 2″. i may have overdone it, in the future i’ll probably add an inch back in. i cut my neck binding on the bias because i think that looks best when you have striped fabric. 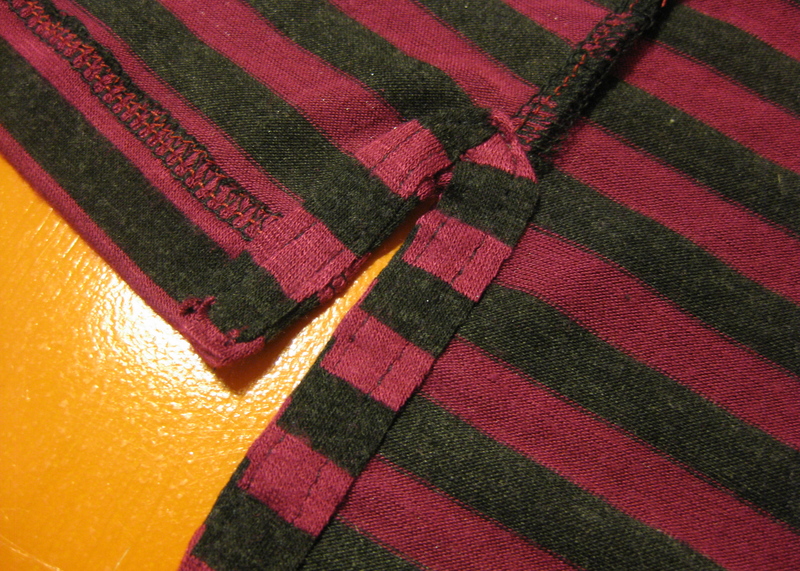 if you cut the binding as usual, any wiggly sewing is really obvious (because of the stripes). you can cut the binding on the grain, but i always feel the stripes look too jarringly angular; the bias stripe feels more subtle. 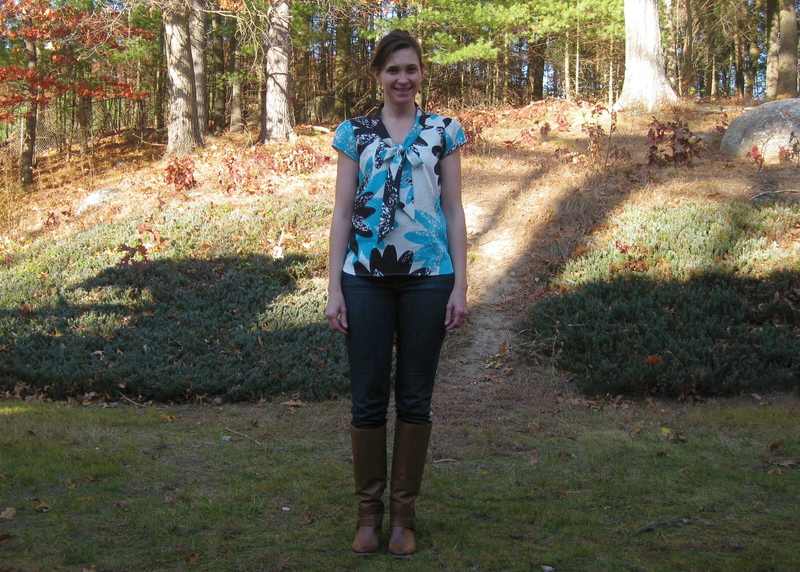 the other change i made was to cut the front piece 2″ shorter than the back, giving me a split hemline. i’ve been wanting to try this out, and i think it worked well here. to do this, i hemmed the front and back separately then serged the sides, leaving the last 2″ before the shorter hemline open. 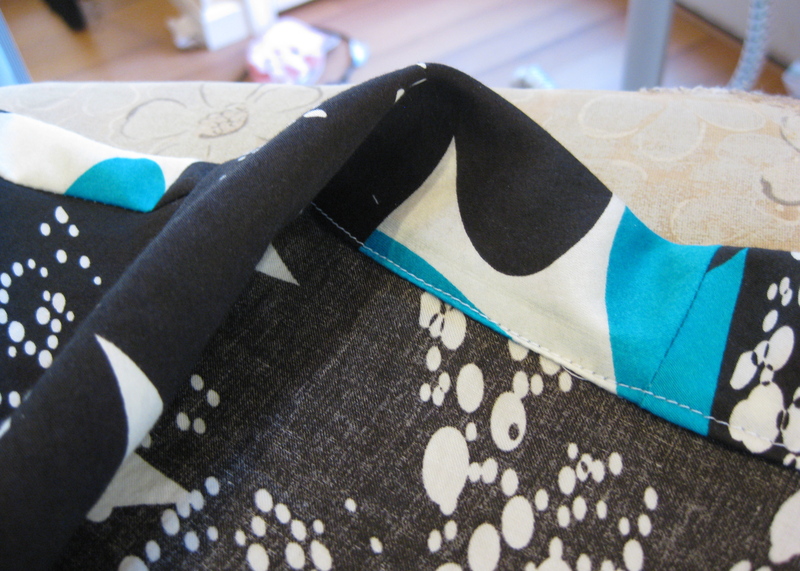 i pressed back a small hem, then took a 1/2″ wide strip of fabric and sewed it along the inside edges. if you look at any polo shirt in your closet, you’ll see what i mean. 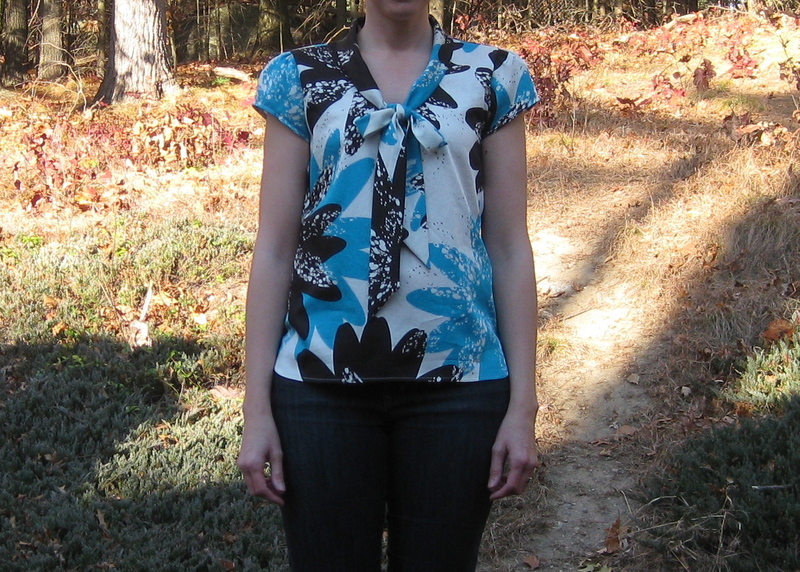 this is a fun and easy top to sew and is perfect for lounging. sure, it is entirely shapeless, but that’s kind of the beauty of it. actually, i wouldn’t mind lengthening it for more of a tunic or even a dress for belting. the only thing i’m not super happy about is the sleeves. they’re awfully wide at the hem, so i may narrow them or cut them down and add a cuff instead. as they are, they don’t stay up when i push them away and it kind of annoys me how they flap around. anywho, that’s just a minor detail and easily fixed. overall, it’s a great FREE pattern and i’m absolutely loving it!